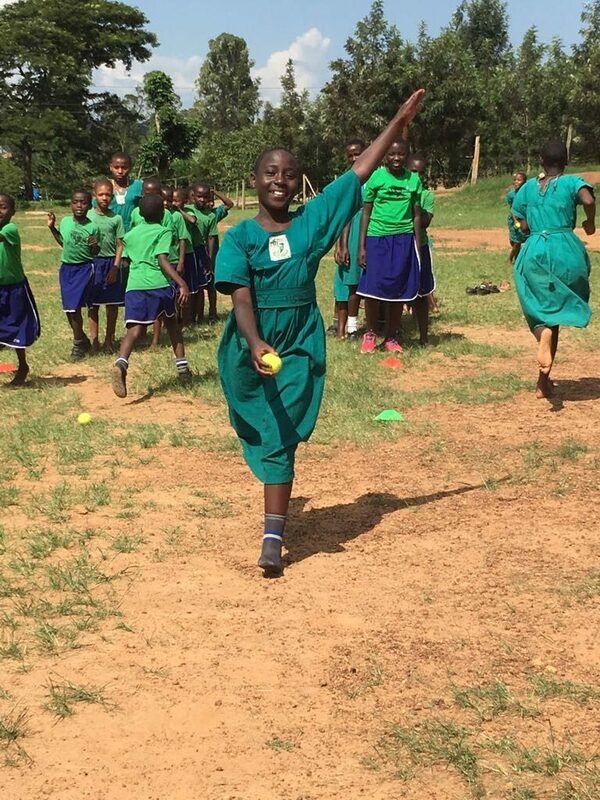 Uganda South: Thoughts from a new volunteer! 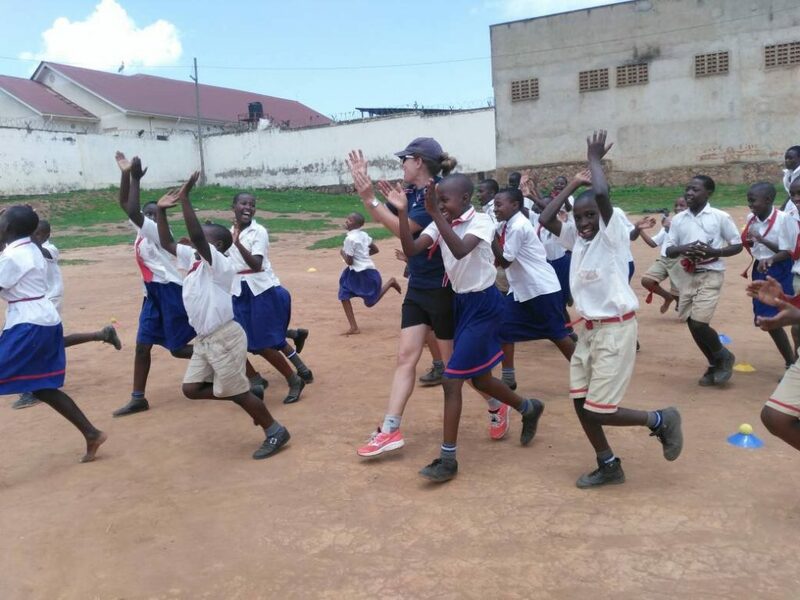 Being my first trip with Cricket Without Boundaries I was a little apprehensive and totally unsure of what to expect as we landed in Entebbe. One week in and I’ve swiftly learnt to expect the unexpected, be wonderfully apprehensive, plan for your plans to change and enjoy every single minute of it. It seems to be the very nature of the African spirit, I wouldn’t have it any other way. Uganda’s way of life is beautifully ubiquitious; everything is happening all the time and I found myself lacking the capacity to take it all in. 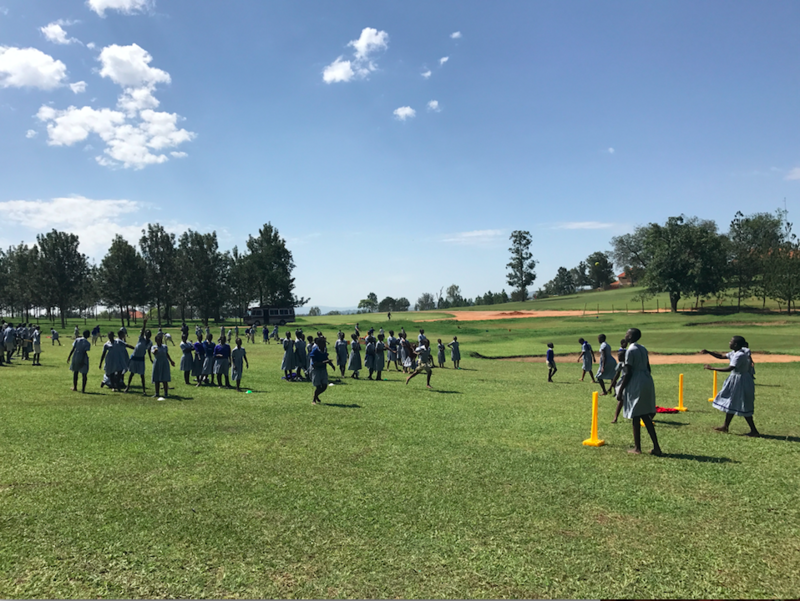 Friday morning brought early doors for the team as Lee and Tommy headed to a nearby paddock (complete with residential cows) for coach education whilst the rest of the team headed to the golf course just outside Boma Primary to kick off the days proceedings. As usual we dug into some relays for our first course and while I was dancing like a silly fool in front of 150 kids, I realised I’d found my niche in the coaching game. 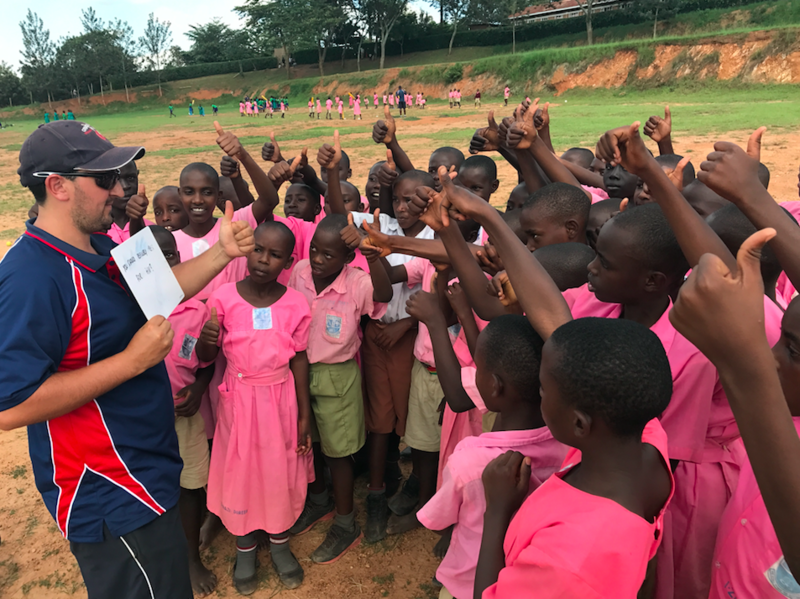 The session was a great success with the children enthused and inquisitive in regards to the message we teach, and as Jhon and Jo held 100% of the attention as they wrapped up I allowed myself 5 minutes to watch a Ugandan man boldly parade around a par three with nothing but 6 iron… Africa. ’10 minutes on the bus and we do this all over again’ Jordan proclaimed as we hastily gathered all the equipment, frantically trying to stick to the schedule and adhere to our British values even though 1 minute to a Ugandan, actually means 27. Upon reaching Mbarara Municipal we noticed more and more people were wearing completely yellow jumpsuits and haphazardly swinging blunt scythes at the dustbowl road before them. The next session we learnt, would take place next to a prison and by this point we were barely surprised and got to work setting up our routine drills. As we plowed through the mid-morning heat trying not to catch eyes with an unattended inmate, Jhon was becoming increasingly alarmed by what can only be described as forgotten dinosaurs that circled above. As these curious storks went about their day, it made for yet another bizarre and breathtaking moment that I simply had to take in. After a quick lunch comprising of 3 months expired crisps and chapatti we regrouped and trundled off towards Saint Aloysius. We were met by roughly 200 kids that adorned the brightest pink and green uniforms I had ever seen. Our playing field was vast and Lee seized the opportunity by the horns and began setting up drills and games spanning the entire region. After some vocal destroying relays on my behalf Tommy, Jo and I cracked on with rapid fire entertaining nearly all the kids from Saint Helenas. Thankfully we had some local teacher coaches at hand that we got to help us, their strict demeanour dampened the wily nippers with immediate effect. As I looked around and observed that was happening it was total bliss to hear laughter and enjoyment echo around this sub-Saharan playing field. Another impressive wrap up from Jhon and Lee which involved Jhon’s hair being wrenched every which way from Sunday and it was time for a beer! Lords Bar was on the agenda for the night as we roamed into town realising that everything was vaguely dimmed by candlelight, just another African power cut, life always continues… just without light. The fact Nile Special was fairly warm wasn’t a deterrent for most as Jo and Jhon cracked into their first of the evening. Lee using his smarts and investing in an ever so tempting bottle of Bond 7. My throat was still haggard so I joined Tanya in a luke warm Krest. Dinner was served at the same time which was an absolute rarity. I tucked into my tomato and onion stew (salsa) and we discussed the days affairs. After a fairly broken nights sleep interrupted due to the heat and the hallucinogenic Malarone dreams I awoke feeling fairly under the weather with my throat being drier than it ever has before. Breakfast and coffee helped adjust that and we were on our way to Army Primary. Usual proceedings took place and Jhon and I were allocated bowling drills with the young’uns. Jhon thankfully took centre stage as I needed to rest my voice and things were underway. I noticed on the outer edge of the exercise a boy just watching, almost to shy to get any closer to the action. I went over to chat with him and realised he had a minor disability, we started playing catch and immediately he started grinning ear to ear. I led him around to the back of a teams line to get him involved with exercise and noticed the other kids started shunning/pushing him away. After a very British telling off and getting them all to high five and include him he quickly settled in and was laughing with the rest of the team. Very satisfying to see, especially seeing Tanya coddle and make a fuss over him in the next exercise after. Good work, Tanya. 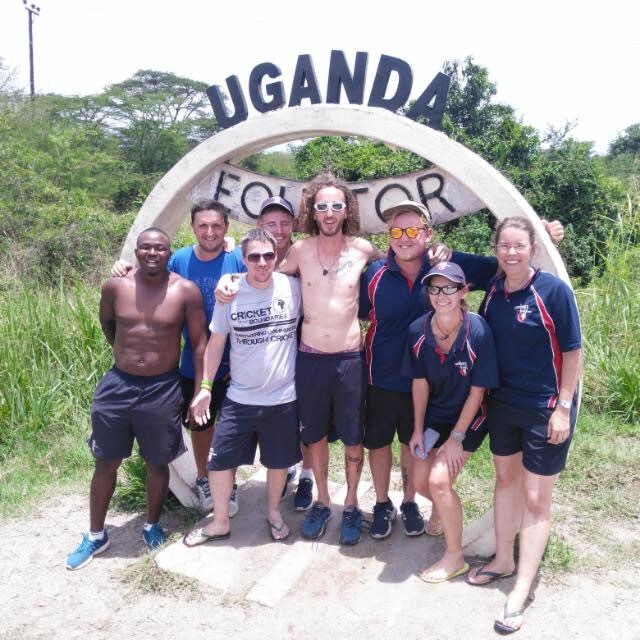 Manny had organised for Jhon, himself and Tommy to head to a local senior school whilst the rest of the team embarked for St Mary’s all girls school. In my humble opinion an absolute treat. The school was magnificent and we were welcomed by the head mistress with bottles of water and kind words, they showed us their choir of beautiful, angelic voices and then led us through to the basketball courts for some fun! The girls were absolutely amazing. Smart, kind, pleasantly competitive and a real joy to be around. Lee introduced hand tennis to them which allowed me a moment to step back and observe. I was fascinated at their ability to work out the dynamic of the game and develop their own intricate strategies as they harnessed their competitive energy into one another, it became quickly apparent who the natural leaders of the teams were. Tanya and Jo did an absolutely awesome job of leading from the front with the wrapping up and it was nice to see the girls fully engaging with one another. After such a pleasant early afternoon it was only fair that I had my share of absolute chaos. We arrived back at the golf course and after finding Jord’s edge on more than one occasion we noticed a swarm of dark green heading over the hill. With what seemed like a small army ready to be engaged Jhon got to work whilst the team setup numerous games, all the while some local Ugandans were still on the hunt to lower their handicap. Manny had a swift yet stern word and they were gone. Jhon and I were assigned crossfire, a usually straight forward game but the kids were more about having as much fun as humanly possible than listening to the rules. 3, 2, 1, GO! Carnage. Kids were running at us, into us, round us, throwing the ball at each other, at the stumps, at us, we were losing control. We emptied our lungs and managed to restore an element of order at the cost of our vocal chords. After establishing the rules the kids were off and seemed to be having the best time. Consistent reminders to stay behind the line were necessary but overall the kids had a blast. A brief team discussion in the sun whilst watching Uganda vs Ghana in a World Cup qualifier and now it’s time for some Mbarara dinner. If you ever get the chance to get involved with CWB, I highly recommend it. Previous Post Uganda South: TEST, TEST, TEST, TEST, TEST! Well written posts. Brings back a lot of good memories. Say hi to Lee. Glad I’m not the only one to have mad Malerone dreams…….